Even the most devoted Sherlock Holmes fans will find much to enjoy in this three-handed comic spoof on The Hound of the Baskervilles, probably the most famous of his adventures. 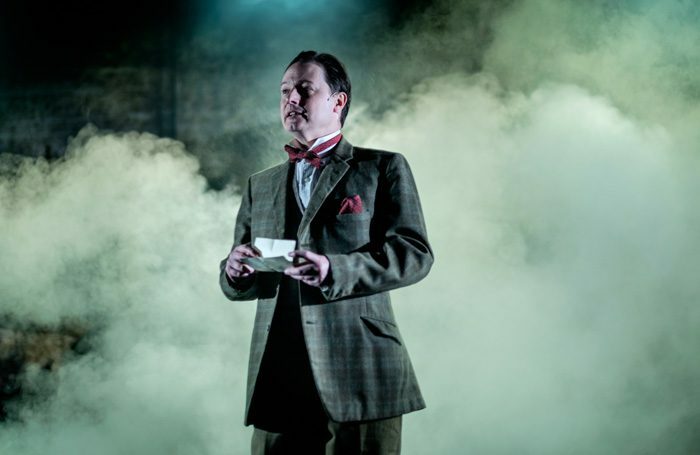 Adapting the story for Peepolykus in 2007, Julian Nicholson and Steven Canny have cleverly mixed a Monty Python approach with loyalty to Arthur Conan Doyle’s horror-on-the-moors plot. Joseph O’Malley, making his professional debut, directs a production of frenetic energy, opening a diverse second season at the Barn Theatre. One of the production’s successes is how it turns the lack of actors into a distinct advantage, with the rapid changing of characters providing just as much fun as the often dreadful puns. The versatile trio are at their best when acting out a silent movie version of a Hansom cab chase, sharing technical glitches with the audience and even opening the second act with a helter-skelter reprise of what has gone before. Herb Cuanalo’s self-important Holmes doubles with considerable elan as South American femme fatale Cecile; Hywel Dowsell’s petulant Dr Watson also adopts the broadest of West Country accents as a country bumpkin; and Dominic Brewer expands Sir Henry Baskerville into a rapid-change portrait gallery of every one of his ancestors. The setting for all this hilarity – the desolate moors of Victorian England – is vividly presented in period back-projections by designer Elin Steele, also making her debut. Meanwhile, Sam Rowcliffe-Tanner’s fast and furious lighting design is matched by blood-curling sound effects from Christopher Cleal.